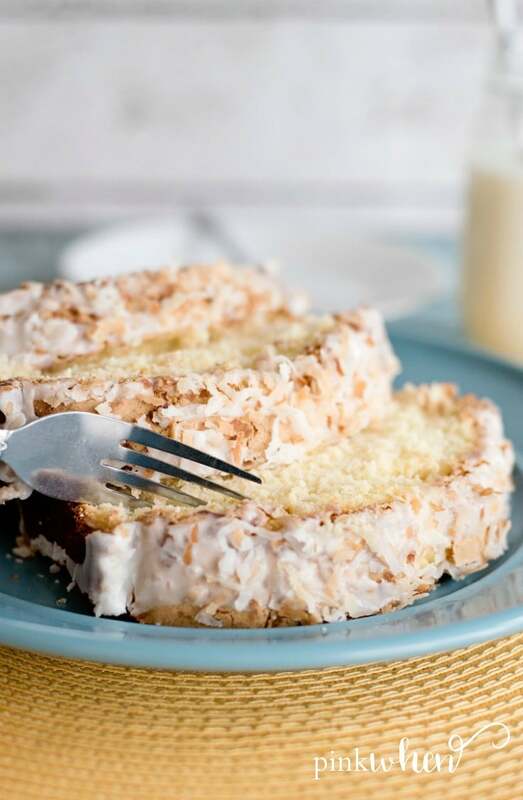 This mouth-watering toasted coconut pound cake is full of texture and flavor, and is sure to be a hit at the next pot luck or family reunion. If you’re in the mood for a delicious dessert but don’t want to spend too much in the way of time and energy, then this easy pound cake recipe is for you. When I was growing up my mom and I would always make desserts. I have so many fond memories of spending time with her in the kitchen and licking the bowls and spoons of countless cakes and dessert recipes. She would never buy my a birthday cake someone else made and designed, she always made her own. Those days have passed, but my daughter now gets to be in my shoes and bake in the kitchen with her grandmother. It’s such a precious memory builder, and there is always a delicious reward at the end. One of my favorite memories of baking with my mom was always when we made cakes. Trust me, she could make some mean cookies and the cupcakes were amazing, but her cakes are just out-of-this-world delicious. Do you remember those old red checkered Betty Crocker cookbooks? I swear we had more of those than we had any other reading materials. Well, maybe other than the Reader’s Digest. But we always had a cookbook open, whether it was handwritten from friends, family shared recipes, or from a publisher. Either way, we were always reading and baking. One thing about my mom is that if it had too many ingredients, she was turning the page. She loved to bake, but she loved it when things were also just simple and easy. 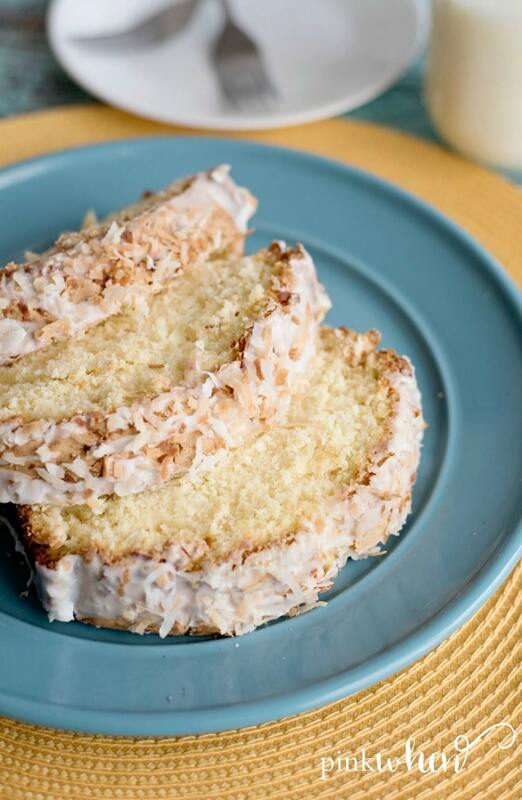 That’s why I am sharing this delicious toasted coconut pound cake recipe. It might sound exhausting, but it’s really simple! I love pound cakes. I can eat them plain or I can eat them drizzled with strawberry glaze. 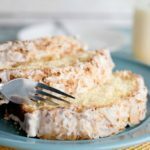 But I am also a HUGE fan of coconut, and this toasted coconut pound cake recipe is just plain mouth watering. The best part about it is that it is still really simple. Now that I am married and have 4 kiddos of my own, I have to keep things simple. Otherwise I might sprout another gray hair. Seriously! I am not joking. If a recipe has more than ten ingredients, I am probably turning the page and looking for something else. A quick idea for when you are toasting the coconut: As you already know, it’s virtually impossible to purchase a small bag of coconut. You are 9 times out of 10 going to have leftover coconut to use after making this recipe. My suggestion is to make some yummy no bake coconut energy bites for whenever you re on the go at one of your kiddos sporting events. They are so yummy! Well without further adieu, here is that amazing Toasted Coconut Pound Cake recipe. Make this in the kitchen with your kiddos, or grandkids, or heck, grab a neighbors kid. You just have to let someone lick the bowl and watch that reaction when the sweetness hits them. When you are finished, allow it to cool, but cut it while it is still warm and serve it with a small scoop of vanilla ice cream. I promise you won’t be disappointed! 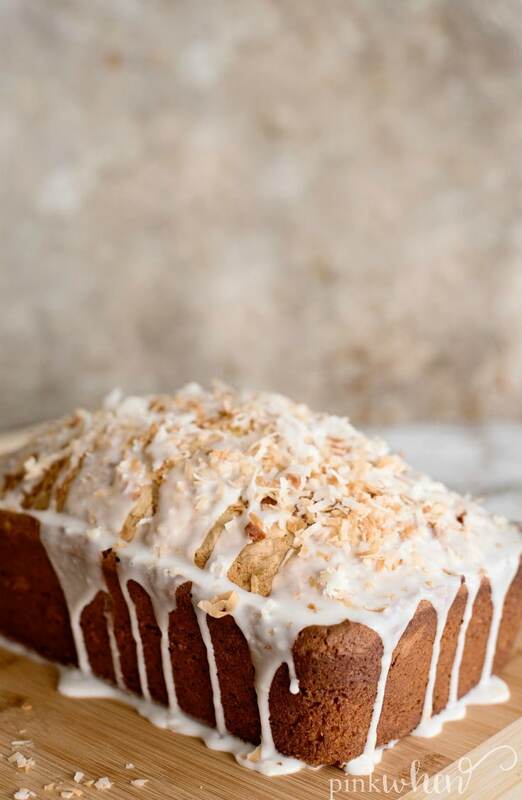 This Toasted Coconut Pound Cake Recipe is not only delicious, but it ranks right up there with AMAZING! 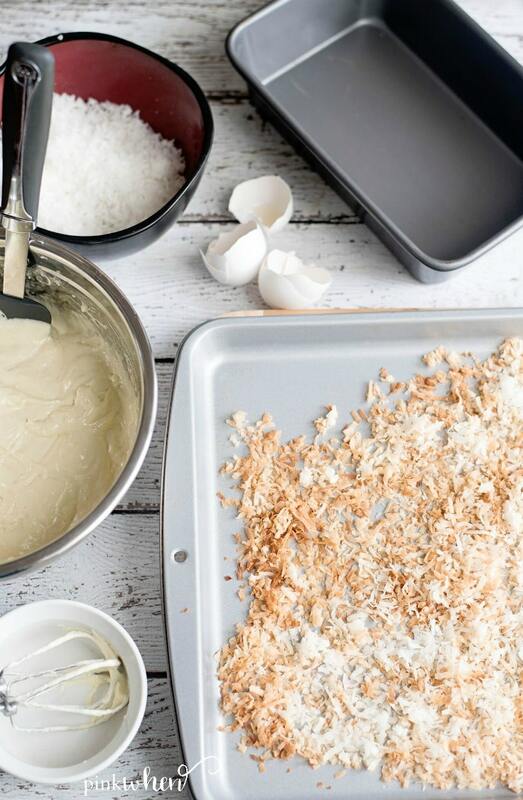 Spread the coconut out onto a baking sheet and bake in the oven for 5-10 minutes. n a medium bowl, combine the flour, baking powder and salt. Set aside. In a large bowl, mix the butter and sugar together until it’s well combined. Add in the vanilla and then the eggs. Mix until everything is nice and creamy. Slowly add in the flour mixture alternating with the buttermilk, scraping the sides and mixing well. Fold a cup of the toasted coconut into the batter. Pour into a prepared loaf pan and bake for 55-60 minutes, or until a toothpick comes out clean. Cool for 10 minutes and to then transfer to a cooling rack to cool completely. Prepare the glaze and spoon over the cake. Top with the remaining toasted coconut and enjoy! If you loved this cake, make sure you check out my Smores’ Cake Recipe, or this easy No Bake Banana Pudding Cake. This cake is making my mouth water! I love toasted coconut; such a perfect dessert for spring! Our family made it this weekend and it was amazing! It’s a keeper. This pound cake looks amazing! I love the coconut addition – it’s perfect in my opinion!